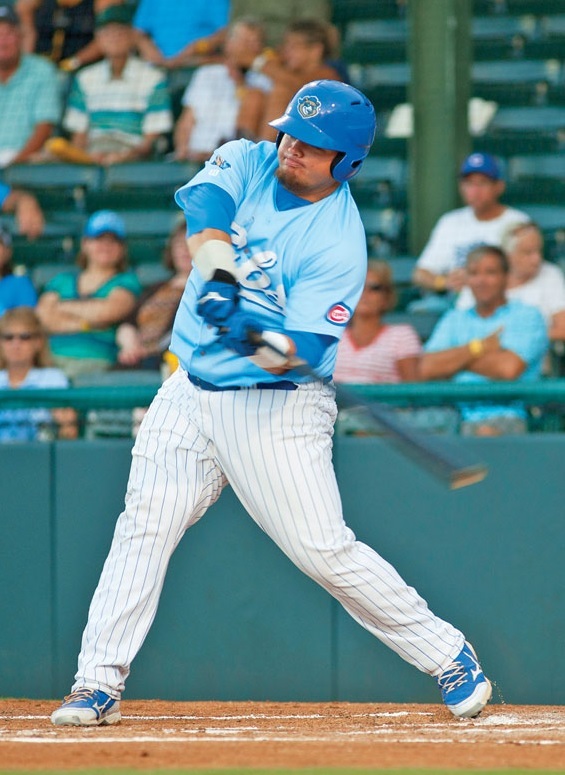 Daniel Vogelbach was drafted by the Cubs in the second round of the 2011 draft, after batting .467 with 19 home runs over the course of 34 games in his senior year of high school. Following the draft, Vogelbach continued to hit, ripping 17 homers, driving in 62 runs and posting a stellar .322 average in his first professional season in 2012. A .285 career hitter, Vogelbach has slugged no fewer than 16 homers a season, and has been able to keep his strikeout numbers very low — a rarity in power hitters nowadays. In 2014 with Daytona, Vogelbach put the ball in play a ton, striking out just 91 times in 482 at-bats — helping him to drive in a total of 76 runs for the second straight year, and further putting himself on the map in a farm system that is extremely strong at the moment. A member of a top ten prospects list that includes the likes of Kris Bryant, Addison Russell and Albert Almora, players such as Vogelbach are helping the Cubs look to be finally making the climb back to a contending team. I have played baseball since tee ball. I always knew that was my first love, but I played all sports growing up. My family has been my biggest influence on me. They are always there for me and would do anything for me. Chipper Jones was my favorite player growing up. I was always a Braves fan, and I always liked the way he played the game. 3.) You were drafted by the Cubs in the 2nd round of the 2011 draft. What was that process like for you? Where were you when you first found out? Initial thoughts? Going into the draft, I had a pretty hard commitment to the University of Florida. I always wanted to be a gator my whole life, and anything else was a plus for me. So when draft day came, I just left it in God’s hands, and I knew he would lead me down the right path. It was for sure one of the best days of my life, and being able to spend it with my family was even better. I am for sure blessed with the way things turned out. 4.) You’ve stated a desire to continue playing first base as your career progresses, but have been projected in the past by some as merely a future designated hitter. What have you done both offensively and defensively to help put you on the path needed to be a major league first baseman and not just DH? I don’t get caught up in what people say I can and can’t do. I work hard everyday to pursue my dreams. And I continue to improve my game every day to be the best I can be. I love playing first base and I love being on the field. And that’s what I plan on doing throughout my career. 5.) Always posting great power numbers over your baseball career thus far, you’ve also been very consistent in hitting for average. What kind of adjustments do you make to keep from being the type of power hitter that hits for a very low average, while still maintaining the pop in your bat? When I go to the plate I have a plan and I always try to stick to that plan. I always try to take what the pitcher gives me and not try to do to much. The home runs will come if I just stay with my approach. I pride myself in not striking out and hitting the ball to all fields. 6.) You had the opportunity to participate in the Arizona Fall League this past season. What was that experience like, playing with and against some of the best talent minor league baseball has to offer? What did you take away from your time there that you plan to use moving forward? The fall league was for sure an honor to be in. I had such a good time with some guys I will be friends with forever. Being with the best of the best you can always pick up on stuff, and I tried to take little things from everyone every day. It was for sure something I won’t forget. Stats are something I try to stay away from. I just try to have good at bats and hit balls hard. We had a great season as a team in 2014 and just fell short. I’m expecting to win a ring this year. Chicken is my favorite food . . . .
My advice to kids is chase your dreams and don’t let anyone tell you that you can’t do something. Big thanks to Daniel Vogelbach for taking the time to answer my questions. This entry was posted in Dailies and tagged Cubs, Daniel Vogelbach, Interview, MiLB, MLB, Prospect, Twitter by Matt Huddleston. Bookmark the permalink.